While I’m still anxiously waiting for my carpal tunnel syndrome to be vanquished completely, I thought I’d start sharing some of the photos from my amazing trip to Washington, DC: starting with incredible Hudson River School (& beyond!) landscapes from the Smithsonian American Art Museum. Until I regain my full typing stamina, these unbelievably beautiful paintings will have to tell the story for me–but hey, if your average picture is worth at least a thousand words, I’d say these works of art are more on the exchange scale of a million. Shipwrecks, arctic twilights, and the Northern Lights? It’s like this painting was made just for me! I can’t get over how delicate and detailed these lace motifs are. 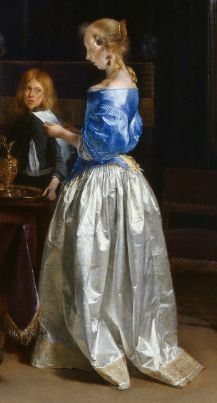 This dress is giving Ter Borch (widely known as the gown-painting king of Western art) a run for his money! I’ve always dreamed of seeing Thomas Cole’s The Subsiding of the Waters of the Deluge: ignoring its Biblical context, it makes me imagine some foreign, water-bound planet, empty but for that single flat boat braving the waters. Wow! Those painting are just WOW! I imagine it was exciting to be able to see them in person. Glad to hear you are on the mend! Take care!